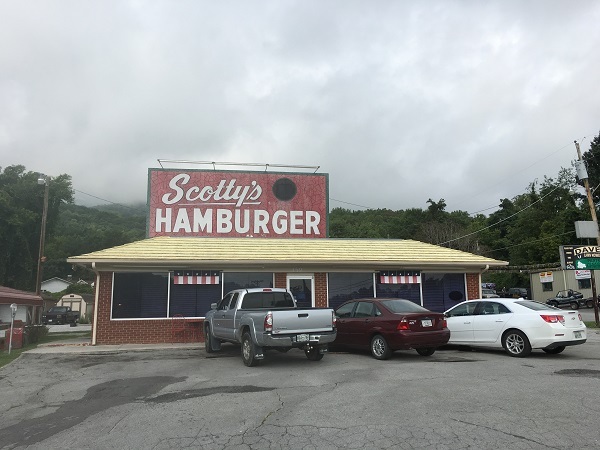 Scotty’s Hamburger, Caryville TN – Marie, Let's Eat! At the beginning of August, we took a short road trip which was more about the journey than the destination(s). For many years, I’d wanted to linger in the Cumberland region, where the borders of Tennessee, Kentucky, and Virginia all meet, and so, one Friday morning just after the sun rose, Marie and I loaded our son in the car and headed north up I-75 for a couple of hours. We stopped in Caryville for breakfast at a place that was just a little bit familiar. 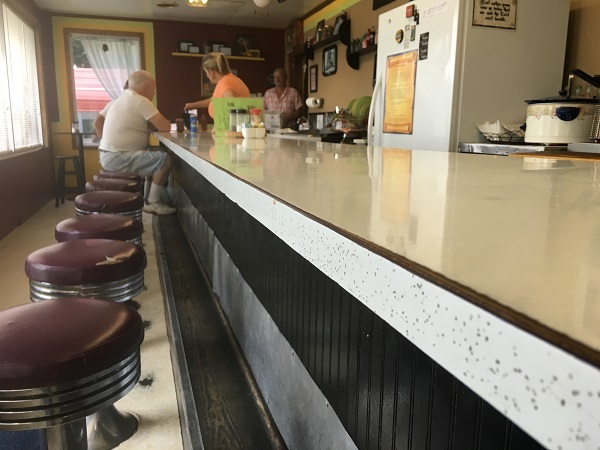 Back in March, we shared a cute little Knoxville-area diner from the 1960s with you. It’s called Scottie’s and it is one of three left from a small regional chain. It is spelled differently, but the Scotty’s in Caryville was once a sister store, and there is a third survivor in Etowah. You’d think that they’d all spell the name the same way, but fifty years ago, what we think of today as “brand standards” were evidently a little looser. This was one of the last stores in the failed chain to open; the building for Scotty’s Hamburger was erected in late 1971 and it opened for business in March 1972. It’s been independent since the Carter administration. The Scottie’s in Powell has a larger building with more seating and some booths, but this place is just a long diner counter. When we visited, only one employee was behind it, taking orders in between cutting up and carrying on conversations, getting the day’s news from her regulars while tossing sausage and eggs on the flattop grill. Marie had her usual diner breakfast of fried eggs and toast and our son ordered a pancake, which turned out to be the biggest pancake that he’d ever seen. I had three cheeseburgers. The sliders here are a simple $1.30 apiece. I didn’t need three of them, since we were planning to make five stops on the first day, but I was hungry and we wouldn’t be stopping again for about four hours. I had a side of “hot rounds,” basically fried potato wedges with a mildly spicy seasoned salt – our server made out that they were much spicier than they really were – and that was a pretty good breakfast. 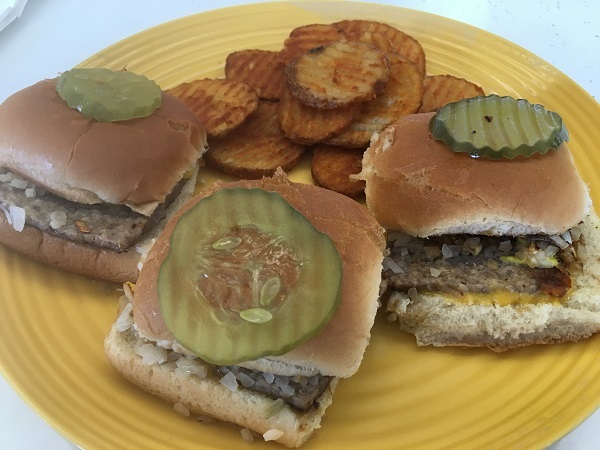 The burgers come with mustard and onions, as old-fashioned diner burgers in the south typically do. Scotty’s is located across the street from a Shoney’s. There is no excuse for anybody stopping at that big ole chain for breakfast when this place is right across the road. It’s interstate-convenient for anybody traveling between Knoxville and Lexington and certainly worth visiting. Posted on September 18, 2016 by Grant G.Posted in breakfast, burgers, tennesseeTagged breakfast, burgers, caryville, diners, tennessee.